The Minister of Justice and Attorney General of the Federation (AGF) Abubakar Malami (SAN) has asked a Federal High Court in Kaduna to declined jurisdiction over a suit by embattled former chairman of the Presidential Pension Task Team, Abdulrasheed Maina, challenging the arrest warrant issued against him by an Abuja court. Malami urged the court to dismiss the suit and allow the Economic and Financial Crimes Commission (EFCC), the government agency that got the arrest warrant, to proceed with Maina’s arrest and prosecution. The AGF told the court that granting any of the reliefs sought in the suit by Maina will do incalculable and permanent damages to the nation’s fight against corruption as well as reverse all gains made so far. Malami stated these in court processes he filed in response to the suit filed by Maina. The Minister, in his counter affidavit, argued that “since a court of law cannot shield any person from arrest, investigation and possible prosecution, the plaintiff (Maina) cannot claim to have any legal right in an effort to stop any subsequent arrest, investigation and prosecution”. He urged the court to decline jurisdiction because Maina’s suit was wrongly commenced. 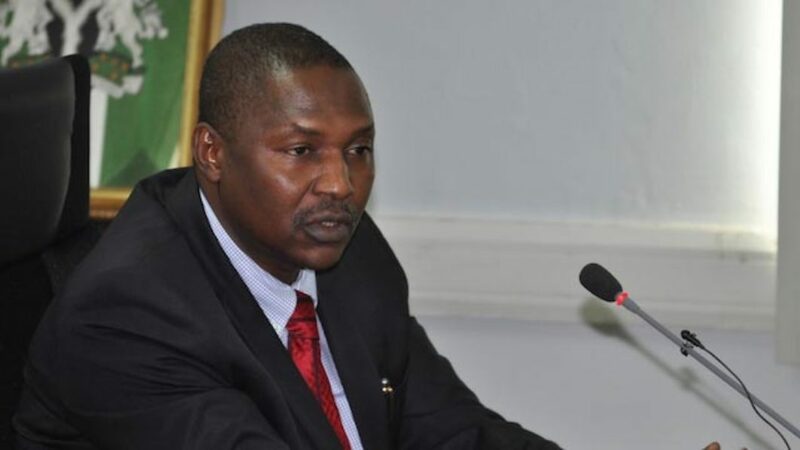 Malami also described the suit as an abuse of court process on the grounds that Maina had filed a similar suit before the Federal High Court, Abuja. Further proceedings will resume in the case on January 15, 2018.